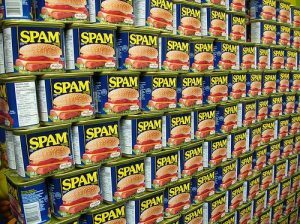 ‘Spam’, meaning unsolicited email, was coined out of an enduring love by Americans of Monty Python. It refers to a sketch where the word is repeated over and over again. Get distracted. Watch it now! In 2003, laws were introduced in the UK and US to reduce emails sent to recipients without consent. The US Can Spam Act and UK Privacy and Electronic Communications Regulations state that you can not send unsolicited emails from ‘harvested’ email addresses such as databases of email addresses. So, Why Do you Get So Much Spam? There is a caveat. You can email individuals with a ‘clearly defined customer relationship’. This could be a single email exchange. The main law regarding content is that you must provide an ‘opt-out’ option and act on this immediately. Trawlers are robot programs that scan web pages for published email addresses to harvest. Don’t display your email address on your site. Use a contact form. This also allows you to track website responses. Do not use your email address as a username on forums as this may be published. If you must publish your email address in a forum message, spell out the ‘at’ and ‘dotcom’ part. Some forums won’t let you include your email addresses for this reason. If you spot spam, click the ‘report’ button. This sends all future spam to your junk folder from this source, even if they have a different ‘from address’. 2. Should I unsubscribe ? Warning! If you receive an email from someone you know, check they sent it. Send a new email, politely asking if they sent it. Their email address may have been harvested. If they confirm, unsubscribe. If you can not confirm the source, do not click on anything! Do not reply, click on a link or unsubscribe. Report it as spam and ignore it. If you have concerns about an on-line shopping site or forum, set up a webmail account just for these sites. If you get flooded with spam you can delete this email account. Most email systems allow you to set up filters to report spam or block specific email addresses. Gmail’s is very strong which is why a lot of hackers use it! It also allows you to prioritise important email addresses to appear at the top of your inbox. A ‘nonce code’ is a number used once. Gmail has 2-step verification where a nonce code is sent to your phone to use when you sign in. By all means uncheck the box asking if you wish to receive marketing material, however that’s no guarantee against spam. Despite the act, assume your email address may be passed on for harvesting. You can not hold back the tide, but you can redirect it. A crystal clear, enticing website by Ambrose Designs, obviously. Studio 2: 41 Cedar Rise, London N14 5NJ.